A complaint was made to the Department of Transport back in January. BACK IN JANUARY one individual made a rather strange complaint to Dublin Bus. This particular customer was not annoyed about a recent price hike or a cancelled service – but rather the etiquette of drivers at a bus stop they used frequently. Writing in, the person complained that drivers had been urinating in front of their 4-year-old daughter at the Ongar terminus. This complaint was released to TheJournal.ie as part of Freedom of Information request to the Department of Transport for correspondence regarding Dublin Bus. The person making the complaint said that incidents happened on a regular basis and that complaints made to Dublin Bus had not been dealt with. In response to the complaint, Dublin Bus stated: ”Littering and urinating in public are prohibited by Dublin Bus. Reports of such behaviour are taken very seriously. 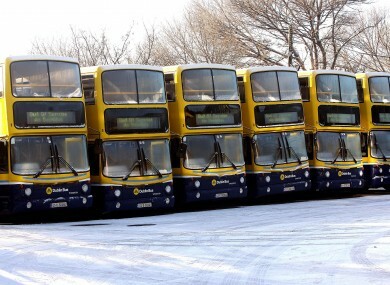 Dublin Bus follow up any complaints of this nature and deal with same through the normal disciplinary process. Ongar is a north Dublin suburb situated in Dublin 15. The number 39 bus route services the area and goes through the city centre. Email “One Dublin Bus passenger was angry about drivers urinating in front of his daughter ”. Feedback on “One Dublin Bus passenger was angry about drivers urinating in front of his daughter ”.